The coaches of the Mite Red program for the 2015-2016 season will be Mike Derks and Matt Garver. Tryouts for the Red team(s) are open to interested skaters from both the 2007 and 2008 birth years. 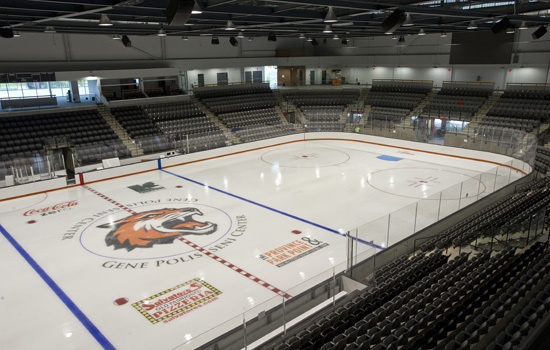 Tryouts will be held at the new Polisseni Center at R.I.T. on Friday, March 20 at 7pm and on Saturday, March 21 at 11am. The tryout fee will be $45. Players attending the tryout must bring a $150 team deposit fee (made out to Perinton Youth Hockey) to the tryout. If you are not currently registered as a PYH player, you must bring a release form to the evaluation session. You can register for the Red team(s) tryout here. 1986 – 1990 Greece Lightning - Monroe County High School Hockey League. 1990 – 1991 Rochester Junior Americans Hockey Club. 1991 – 1992 Port Coquitlam Buckaroos Junior Hockey Club – Vancouver, BC. 1991 – 1992 Rochester Junior Monarchs Hockey Club. SUNYAC Rookie of the Year – 1992-1993. SUNYAC Leading scorer – 1992-1993. My hockey career started at the mite level, playing Rochester Americans Youth Hockey in the early 80’s. I played travel hockey out of Rochester through Pee Wee’s, winning a State Title at the Pee Wee Major level. My family decided to travel to Buffalo, NY to play travel hockey during my Bantam and Midget years. The Buffalo Saints team I played on at the Bantam level won a National Championship, beating the Detroit Little Caesar’s in the national final. I was also playing high school hockey for Pittsford while playing on the travel teams out of Buffalo. I played three years for Pittsford, receiving 1st Team All County Honors all three years and was the team MVP all three years. I broke the Monroe County Single Season points record with 83 points in my sophomore year at Pittsford High School. My dream was to play Division I college hockey so my family and I decided on prep school. We looked at several schools in New England but ultimately decided on the Northwood School in Lake Placid, NY. While at Northwood I set the single season goal record in my first season with 51 goals. I broke my own record the second season with 57 goals and was named team MVP. I received an invitation to the prestigious Hockey Night in Boston summer tournament where I was named MVP of the tournament. I was recruited by several Division I hockey programs including Vermont, Miami of Ohio, Clarkson, Brown, Denver, as well as others. Ultimately, I was offered a full athletic scholarship to play Division I college hockey for Rensselaer Polytechnic Institute in the ECAC before my senior year at the Northwood School and accepted the offer. I was named to the ECAC All Rookie Team in my freshman year. During my sophomore year I was named to the ECAC All Tournament Team in Lake Placid, NY. In my junior year I was Honorable Mention All ECAC Team for the season. I came home to Rochester for my senior year and played for RIT. We won the ECAC West regular season and the ECAC West Conference Tournament. I received MVP honors for the ECAC West Tournament. The season ended in a loss in the National Semi Final game. I was offered a spot in the AHL Rochester Americans training camp after I was done playing college hockey. I spent the 1999-2000 season playing professional hockey in the United Hockey League for the BC Icemen and the Adirondack Ice Hawks.